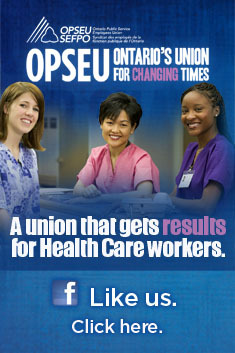 Will advanced IT be the saviour of Ontario hospitals? The Canadian Institute for Health Information (CIHI) has a simple vision: better data, better decisions, healthier Canadians. It does appear at times that we are drowning in data, raising the question of how accurate and timely it is, how it is used, and whether we have the smarts to draw the right conclusions from it. Hospitals have at times complained that the breadth of data demanded by the province raises the spectre that too many priorities means there are no priorities. The choice of what data to collect can create incentives that may not always be the best. The focus on hospital length of stay, for example, has led to charges that patients are being sent home early without adequate care. However, health data can tell us a lot about how we use the health care system and where to put our resources. One hospital executive noted at a recent Longwood’s conference on Big Data that many of their emergency room readmissions came from patients who lived alone – information that would be useful in planning and justifying enhanced home support. Despite the existence of CIHI, not every health provider is on equal footing when it comes to utilizing information technology. The evidence does suggest that the information savvy providers are capable of achieving better health outcomes than the information poor. That’s been the mission of HIMSS – the Healthcare Information and Management System Society — for more than 50 years. HIMSS certifies health care provider organizations according to their adoption and use of electronic medical records. For many, it is the Holy Grail in achieving quality service delivery. Dr. Larry Garber, Medical Director for Informatics at the Massachusetts-based Atrius Health spoke recently at the Longwood’s Big Data conference at the Rotman School of Business. The Ministry of Labour inspectors have significant powers when it comes to enforcing the Occupational Health and Safety Act. What’s difficult to discern is where the dividing line is between issuing orders and prosecuting an employer for violations of the Act. After months of investigation into seven complaints and 77 incidents at Ontario Shores Centre for Mental Health Sciences, in May the Ministry issued 15 orders to address issue around workplace violence. Given how big the investigation was, how many incidents had taken place, and how many workers were interviewed, we were stunned that no charges were laid. By contrast, Ontario Shores was separately prosecuted and fined $37,500 for an incident around a worker injured cleaning and replacing a ventilation hood. Last week we got word by a very convoluted route that the Royal Ottawa Mental Health Centre was facing prosecution on three counts stemming from a single incident of workplace violence in June 2012. Queen’s University researcher Dr. Heather Stuart says the majority of anti-stigma campaigns are not evidence based and few are evaluated. In fact, her research suggests that we may even have to retrench and undo the damage some of these past campaigns have created. That includes discussion of mental disorders as a brain disease. Her research shows that such descriptors actually increase social distance, not close it. “You can’t sell social inclusion like you sell soap,” she told the packed conference room. We’re all part of it, she says, including families and the mentally ill themselves who create a “self-stigma.” That includes self-blame. It’s time for the Ministry of Health to look at the root causes behind the violence and injuries that are taking place in the province’s hospitals that provide mental health care. Given persons who are mentally ill are no more statistically inclined to be violent than anyone else, clearly something is changing in these settings to push reports of violent incidents upwards. While the union is privy to statistics around injuries experienced by its own members, we do not see the parallel data around patient-on-patient violence. Why is it one can go on-line and look at the record of critical incidents at a long-term care home but not at a psychiatric hospital? Sadly, workers being injured in such incidents barely make the news. Some believe that getting punched, spit at or slammed against a wall is part of the job (it shouldn’t be). Hospital managers and Ministry of Labour officials have shown little sympathy for workers suffering from post-traumatic stress disorder — surprising given where this is taking place. Workers at these hospitals tell us repeatedly it’s just a matter of time before someone dies. In fact, that time came this spring. Here’s a story we don’t see every day: South Bruce Grey Health Centre is cutting two of its four senior management positions as part of its efforts to deal with a budget deficit. Contrast that with hospitals such as Ontario Shores Centre for Mental Health Sciences, which carved out a new advisory position for its departing CEO at a time when front line staff are bracing for tough times ahead. The decision may have been slightly easier to make at SBGHC given two senior managers are retiring. However, as most front line workers already know, when you cut vacant positions, it still has an impact on the workload of those left behind. SBGHC is one of the few hospitals to have weathered the last decade without consistently running into deficit. The fact that they are now forced to trim their sails owes a lot to a punitive new funding formula emerging from Queen’s Park. Small rural hospitals weren’t supposed to be part of that formula, but because SBGHC combines resources from four small hospitals together, they do. The irony is that by consolidating their resources these four small hospitals are being penalized. For the Hanover hospital, which has somehow managed to stay out of SBGHC despite being located within the same geographic area, they must be breathing a sigh of relief. Yum. 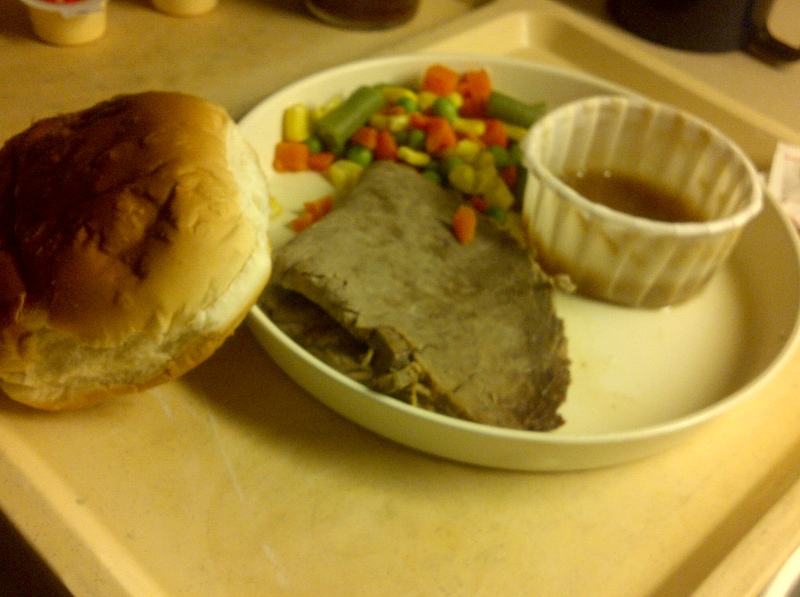 Actual meal at one of Ontario’s psychiatric hospitals. The nurse thought it was a mistake. A large patient at Ontario Shores Centre for Mental Health Sciences was given a plate with six pieces of ravioli on it as that day’s lunch. The nurse on the unit thought it was not going to be nearly enough. When she contacted the dietary department they said there was no mistake, these are proper portions. Staff at Ontario Shores tell us that such portions mean the same patients are down at the canteen later on filling up on less healthy foods. Recently we asked representatives from our mental health sector if they had similar experiences to their colleagues at Ontario Shores. The answer was yes. By being strict about calorie counts, you would think that patients would be losing weight. However, when the evening meal leaves you hungry, there are other options, unhealthy options that result in patients actually gaining weight. In another psychiatric hospital we were told of patients ordering in fast food to fill that hunger. While delivering a pizza or Chinese food to a public hospital may appear odd, it is not uncommon. We were told these hospitals are taking it right to the line with regard to portion size and calorie count.